Despite it being a short drive down Brian Clough Way it's quite rare for us to venture over to Derby but when we're offered an interesting opportunity to try something new we usually jump at the opportunity. So when Pepitos in Derby invited to come down and taste test some of their new menu ideas it was always going to be a yes. 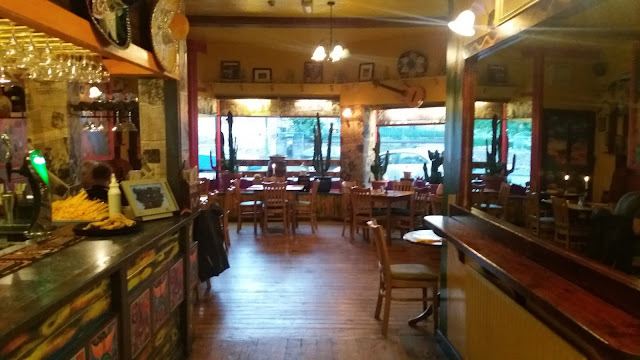 Pepitos has been feeding Derby for almost 20 years with a diet of fresh, authentic and healthy Mexican food in relaxed surroundings. Aside from the recent influx of chain restaurants Mexican food isn't heavily represented around Derby and Nottingham so it's good to see an independent restaurant working to bring in diners. 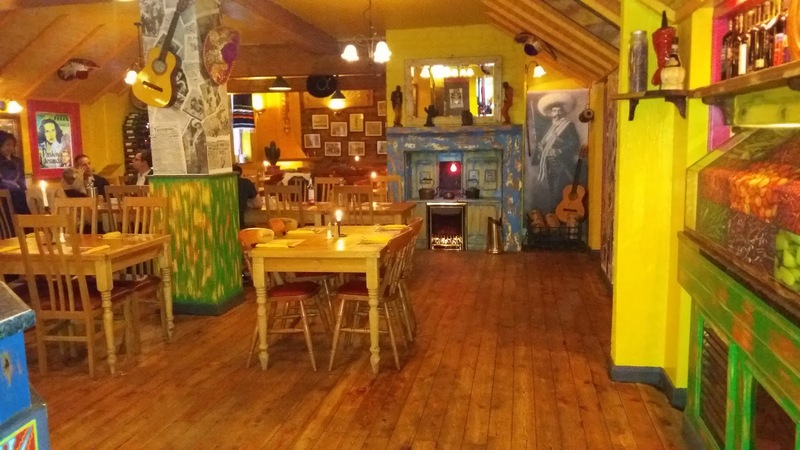 With a quirky interior thats sure to encourage conversation we feel Pepitos is a great environment for a group get-together or relaxed date night. With such an array of foods on the menu many of us may never have heard of, let alone tried it would work as somewhere great for sharing. 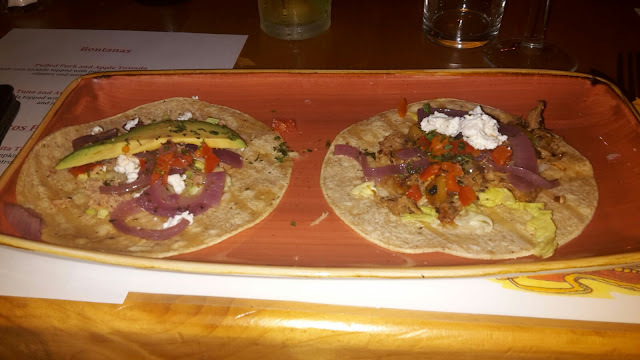 We stated with a small selection of Bontanas- effectively starters of a Pulled Pork and Apple Tostada and a Tuna and Avocado Tostada. Both beautifully fish with a wide selection of fresh ingredients on a soft corn tostada. The Pulled Pork had a very nice warmness to it thanks to a sliver of Scotch Bonnet Chilli. 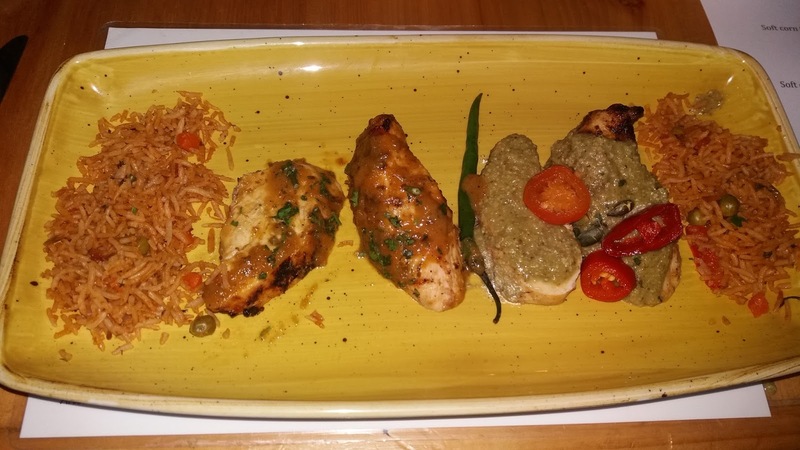 We were surprised initially at the lack of any sauce but the flavours married beautifully and created a moistness we had not expected. Whilst the meat lover in me had hoped for a little more Pulled Pork there was plenty to make this a very nice choice as a starter. The Tuna and Avocado Tostada had a fresh taste on the palate. Nice and light whilst having a cleaner taste. Both would make an excellent choice as a starter. Pulled Pork and Apple Tostada and a Tuna and Avocado Tostada. For our mains we had two dishes. Pepita Tomatilo. Chicken covered in a rich sauce of tomatilo, peanut, cilantro and pumpkin seeds. Beautifully cooked succulent chicken with a lovely richness and volume from the pumpkin seeds and peanuts which had been relatively fine blended to almost a paste. Very nice and very easy to devour. Our second sample was the Pinagrave. Chicken with a glaze of pineapple, orange, agave and habanero chili. With a slightly warming effect this would have been a fantastic sauce with red meat that works equally well with great quality chicken. Initially you tasted the fruity pineapple and orange before a sweetness from the agave and warmth of the habanero. If Pepitos could bottle this sauce they would be on to a winner. We finished our evening with a nice coffee. Everything was provided courtessy of Pepitos Derby for which we must say thank you again as it was a lovely experience for us going somewhere would would not have even considered before. As always the thoughts expressed are our own. We will definitely be heading back to Pepitos when we're next in the Derby area.